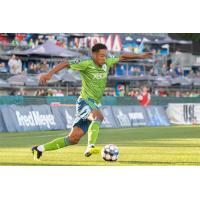 SEATTLE, WASH. - Midfielder Henry Wingo today was named to the USL Team of the Week for Week 22. He recorded a brace in Sounders FC 2's 3-2 victory over San Antonio FC at Cheney Stadium on Saturday, snapping SAFC's four-game winning streak. In the fifth minute of Saturday's match, Wingo received a ball from defender Denso Ulysse and weaved through four defenders before beating San Antonio goalkeeper Diego Restrepo to give the home side an early 1-0 advantage. In first half stoppage time, Wingo bagged his second of the night when midfielder Alex Roldan found him near the top of the six-yard box. The First Team player quickly slotted it past the goalkeeper to even the score at 2-2. The markers were Wingo's first with S2 this season. S2 returns to the pitch this Sunday, August 19, at Portland Timbers 2 (2:00 p.m. PT / ESPN+). It will be the third and final match between the teams this season, with each side previously winning on its home field.